The name Ylang Ylang comes from the word ilang, meaning wilderness, or the word ilang-ilan, meaning rare. This exquisite pale-yellow flower has been used by ancient medicine healers for centuries, particularly in Madagascar and South East Asia where the tropical tree is native. 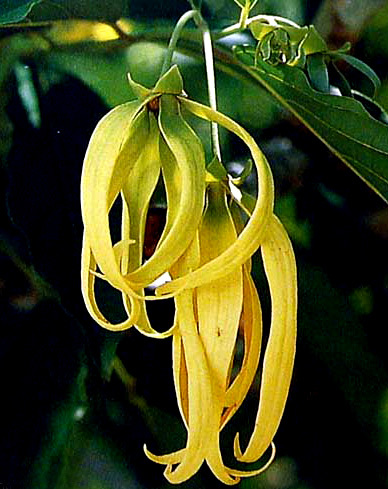 The therapeutic properties of Ylang Ylang a calming effect on the nervous system. Its scent is euphoric, sensual, sweet and feminine. Ylang Ylang can be used as an antiseptic as well as to reduce anxieties, relieve stress and help treat depression. It can also help to lower blood pressure and menstrual disorters. A few drops of essential oil in a bath is all that is needed to have effect on the body. Too much can be overpowering and lead to headaches. The people of Indonesia and the Philippine combine it with coconut oil to use in skin creams for it sweet and exotic floral scent. 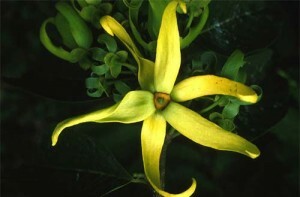 Today many organic cosmetic and beauty products contain Ylang Ylang. You can find moisturisers, bath oils, body washes, and natural candles that contain this most exotic of heavenly scented flowers.